Ericeira, Carvoeira - House inserted in farmhouse with ecological pool and 5 minutes from the beach. 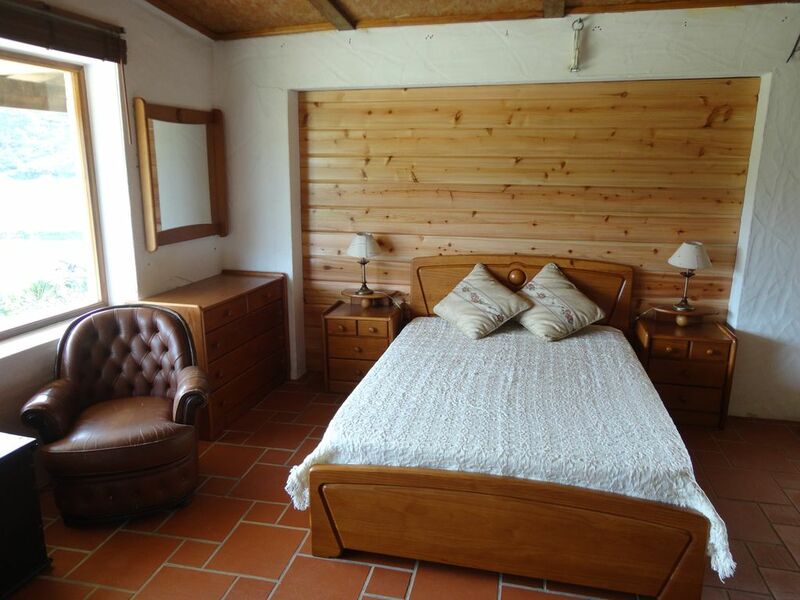 Located in a green valley where you can enjoy all the peace and quiet of a real country house. Only 5 minutes drive from the village of Ericeira and the main beaches of the area. Welcome to Eco Country House, a spacious cottage in open space, with a kitchenette, sitting area with couch and TV, a double bed, a bunk bed, one sofa bed and bathroom. You can enjoy a magnificent meal on the porch overlooking a green and peaceful valley, prepared on the outside barbecue or kitchen with oven, stove and all the necessary material. The house hotdog a private ecological swimming pool. A ten-minute drive away all moved, restaurants, cafes and trade existing in the village of Ericeira. Carefully decorated for your comfort and well-being. A bathroom with new equipment, a good shower and a very functional toilet. You will find in the house all the necessary information about the town, cable TV with 100 channels, free wi-fi in all areas, commodity kitchen and bathroom, towels and sheets, washing machine, coffee maker, microwave and other small appliances. Located in a farming valley ten minutes from the beach of Foz do Lizandro and S. Julian, this quiet country house has a swimming pool, canoes to enjoy a trip on the river that passes right next door and bicycle to be able to easily go to the beach without much effort. It is located in the Bunker, only 5 minutes drive from the village of Ericeira and it easily enables lunch, dinner or simply a drink in one of the numerous bars and existing restaurants in the village. Our goal is to have a memorable experience in Ericeira. For this reason, we began to communicate with you before arrival, in order to prepare your stay with quality. We provide directions to the house and all your doubts and questions are answered promptly. Can you tell us about your interests and help you plan your stay, so you enjoy the villa in the best possible way! Upon arrival, waiting for you at the apartment to welcome you and give you the keys. We offer you maps and tourist information and if you want to know the village, we will be happy to accompany you! Come and feel a place, you will not regret! Typical fishing village, Ericeira is between the Serra de Sintra and the Atlantic Ocean and very close to Lisbon. Rich in history and fishing, today Ericeira is one of the most popular bathing areas in the Lisbon region, due to the beauty of its beaches and crystalline waters, so rich in iodine. The affable character of its people, the harmony of the village with its narrow streets, its monuments and its traditional houses, make Ericeira a unique place. Its landscape is unique. Ericeira is 40km from Lisbon and the fastest way is by highway, is 30 minutes maximum. If you choose to come by highway (no toll) will take a little more time but may make a stop in Sintra. In addition to the car itself, you can use the transport of regular career or our transfers. This is the perfect choice for those who want to stay near Lisbon, but away from the dynamic city. Here you can choose between calm and commotion, and everything is two minutes from where you can enjoy all the peace and quiet of a real country house. Only 5 minutes drive from the village of Ericeira and the main beaches of the area. We thoroughly enjoyed our stay. It was just the 2 of us. We loved the house, but note it is completely open plan; the bunkbeds are in the same area as the dining table, the tv-corner and the double bed. We missed that in the description on Homeaway, but figured it out through the photo's on the site. We loved the outside and used both the pizza-oven and the bbq. We enjoyed the pool and it was warm enough. We loved the pond and enjoyed watching the frogs. We had breakfast on the deck, which was lovely, and we often had dinner at the picknick table, except for when it was too cold or windy. - Add a light under the kitchen cabinets, so you don't stand in your own shadow when using the counter tops. - Add a way to turn on the light over the stove without turning on the noisy fan. - Add a way to turn on the shower light, without turning on the fan. - We found the ironing board, but no iron. - Replace the kitchen cabinet handles that we improvised with proper handles. - Provide 2 large towels per person, so you can have 1 at the pool and 1 for the shower. - Replace the futon with nicer outside furniture and add a proper table. - Add trees to block the view from the new house to the vacation home and the pool.